I felt I gave this one a fair shot, despite everything from end-of-year burnout to post-vacation blues seeming to conspire against me. In the end, this was simply not the engaging tomb-raiding adventure on an alien planet that I was expecting, and mostly found myself bored and unable to see why this book couldn’t be half the length with the same plot content. The story begins on Gaia, a far-flung planet discovered when a message was intercepted from its long-extinct inhabitants, an ancient race which called itself “the Undying”. Aware that Earth is on its last legs due to overpopulation and environmental degradation, scientists saw this new world as the answer to all their prayers—finally, humanity has a possible home for the future, and the Undying’s advanced technology will also help Earth become sustainable again. As a result, people from all walks of life flocked to Gaia to see mysteries and treasures can be found among its abandoned ruins. When the book begins, readers meet Amelia “Mia” Radcliffe, an American teenager from an impoverished background who is on Gaia trying to raid its temples for valuable goods in order to buy passage back to Earth. Then there’s Jules Addison, a young English researcher whose father is a leading authority on subjects related to the Undying. Educated and well-to-do, his upbringing couldn’t be any more different from Mia’s, though he also finds himself on Gaia hoping to trying to unlock its secrets. Scavenger and scholar are soon thrust together in a tenuous alliance, despite their differing reasons for illegally traveling to Gaia. Amelia is motivated by the potential payout, though later we find that the money would be used to save her li’l sis. Still, this puts her at odds with Jules, whose intentions are mostly scientific as he seeks to further his father’s research. Nevertheless, a romance eventually develops as the two of them grow closer in their battles against hostile scavengers and dangerous booby traps. The premise sounded great, and I truly thought I had a winner right up to the moment I realized the best parts of the book were all in the beginning, e.g. the history of Earth’s gradual decline, the backstory of how hope was rekindled when an alien planet was discovered, and how the Undying could prove to be humankind’s salvation. Even the meeting between Amelia and Jules was sweet, albeit in an awkward, stumbling sort of way. The story might have continued to interest me had it followed through with more Undying and Gaia-related intrigue, but instead the authors opted to go all-out with the romance, attempting to spruce up this unimaginative love story to pretend that it is more unique than it really is. The alternating perspectives between Mia and Jules also caused a lot of repetition; almost every major event had to be covered twice, and the narrative expounded upon the characters’ emotions again and again. Like I said, this book could have been half as long, and I doubt much would have been lost. 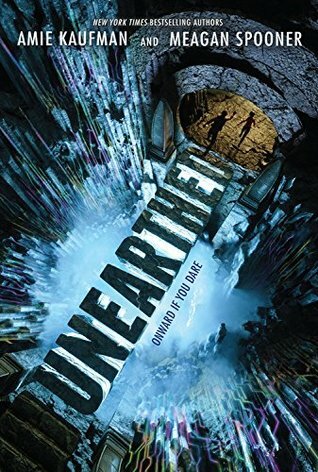 Admittedly, I listened to the audiobook of Unearthed over my winter vacation, which meant a lot of interruptions and starting-and-pausing, but even after days of this, it surprised me how little plot progression there was. The unnecessary exposition and internal dialogue also got in the way of the romantic elements, making this contrived pairing between Mia and Jules all the more uncomfortable to watch. To be fair, I am super hard sell when it comes to romance. Especially YA romance. I think the authors could have struck a better balance between the romantic elements and the rest of the story, bringing the exploratory and scientific themes to the forefront while cooling it with the hasty and almost desperate way they seemed to want Jules and Amelia to fall into each other’s arms. Sorry, I just wasn’t convinced. Overall, I see the potential here for more. However, I doubt I will stick around for the sequel, considering how even that cliffhanger at the end failed to entice me. There are better YA sci-fi adventure books out there, not to mention plenty of them probably also feature couples who have more chemistry than Amelia and Jules. Audiobook Comments: It’s possible that some of my issues with Unearthed stemmed from the fact I was listening to the audiobook, though I doubt my rating and review would have changed much even if I had read the print edition. Still, I had a few quibbles with the narration, especially with Alex McKenna’s performance as Amelia. Maybe McKenna was just having a bad day, but her voice sounded hoarse, even sick and weak when it came to certain chapters. This was distracting and made some of her words hard to understand. On the other hand, Steve West, reading Jules’ chapters, was amazing. I could listen to that guy’s accent forever. This sounds a bit disappointing, I was curious about this one mainly due to the temple exploring angle. And the fact that it could have been shorter, and the YA romance… maybe I’ll wait on this one. The premise was interesting, but ugh, I just couldn’t get into the story or characters at all. I’m a super tough customer! With so many YA romances these days, I just get really picky. And I agree, Amie Kaufman’s collaboration with Jay Kristoff on the Illuminae Files series has spoiled me, I just can’t stop comparing her other books! Ah, man! I may still read it. I’m glad to know the audio is a problem. I have trouble overcoming bad narration. I will stick with a print copy. There are better YA sci-fi books out there! Ugh, so disappointing to see a 2 1/2 star review😐 I received a copy of this unsolicited, so it’s really whether or not I have time to fit it in, well see. Oh no! When I read Amie Kaufman’s name I had great expectations because of the Illuminae Files, but your mention of repetitions, internal dialogue and the mandatory love entanglement sounded like a death knell for this story… I’m sorry that another book you had such hopes for ended up failing you…. OMGGGGGGGGG MOGSYYYYYY!!!! I’ve been reading this book for DAYS and I swear it has not picked up! I thought it was end-of-the-year blues or something! This book is seriously bringing me down. Usually I breeze through books in several hours, and move on, but this book is holding me back. I’m setting it aside. THANK YOU for writing this review because you made me realize that it isn’t necessarily *me* that is the problem here! Perhaps it is the book! I came very close to requesting a copy of this one so I’m breathing a quiet sigh of relief right not because this doesn’t sound like it’s one for me. Such a shame though. Yeah, I was so disappointed! It sounded so good and right up my alley from the description!